Have you ever dreamed of having a canopy in your bedroom? Well now you can and its cheaper and easier than you think! In my goal to makeover my bedroom as inexpensively as possible I knew I had to have a canopy of some type. 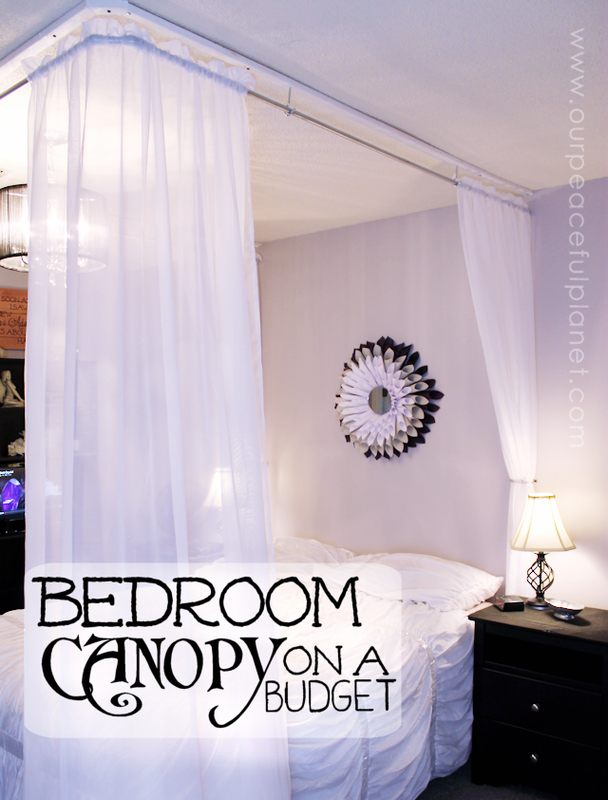 Roy came up with a wonderful way that allowed me to do that and we’ll show you how to make your own inexpensive DIY bed canopy. This is part of our Bedroom Makeover on a Budget Series. Beautiful ! What a great, romantic feeling to your bedroom. So simple too, you and your hubby make a great team ! How pretty and you made it look doable, what a fun project! Thanks for stopping by Carlee! What a beautiful job you did on this – thanks so much for the tutorial – pinning ! You’re so welcome Suzan. Thanks for visiting and commenting! This is such an amazing idea! Thanks for sharing it. I’m Anita visiting from Artsy-Fartsy Link Party. Next: Dragon Eyes : A Dragon Craft for Adults & Kids Alike!